Customized cars from various eras provoke an odd range of reactions, everything from wistful nostalgia to biting sarcasm. Then there’s something in between, an amused reflection about times gone by, and how a car characterizes the attitude of an era. 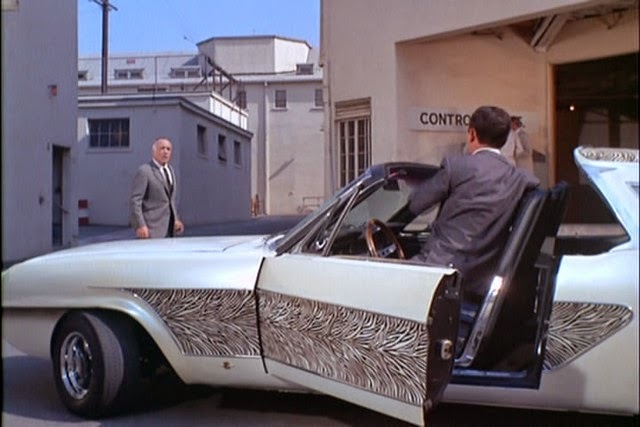 For instance, consider the Barris Zebra Mustang, which appeared in the farcical Frank Sinatra romantic comedy, Marriage on the Rocks. The odd plot, along with Sinatra’s period lingo (indicated in quotes), are right in tune with the quizzical styling of the car. While Sinatra the singer was the “living end,” the movie was “Endsville,” revolving around a love triangle and a married couple, Dan and Valerie Edwards (Frank Sinatra and Deborah Kerr, better known for playing opposite Yul Brynner in The King and I). Seeking to put the “wow-ee wow wow” back in their relationship, they take a second honeymoon in Mexico, where a shyster lawyer (Cesar Romero, who played The Joker in the Batman TV series) gets them divorced without their full knowledge. 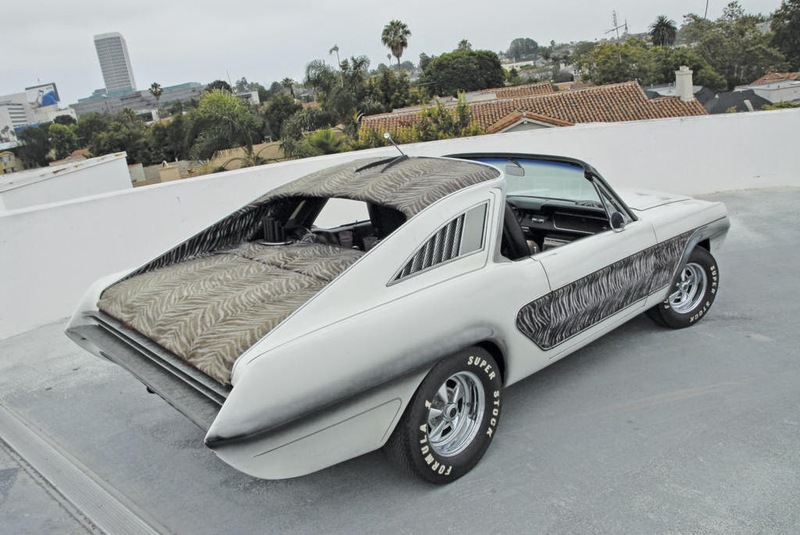 According to the book, Barris Kustoms of the 1960ies (by George Barris and David Fetherston, now out of print), Barris and his project engineer Richard Korkes built the car by extending the nose of a ’65 Mustang a full 10 inches. The scalloped and rolled metalwork was hand-formed and gas-welded in 20-gauge sheet steel into a gaping oval, then fitted with an all-aluminum, seven-rib, V-shaped grille and a double set of deeply recessed Cibie headlights. (This dual treatment was actually ahead of its time, as it would be used on later production designs.) The horizontal split between the upper and lower headlights continues around the sides of the front fenders, forming a flared body contour, just below the beltline, that extends past the front wheelwell and angles sharply downward to the rocker panel. 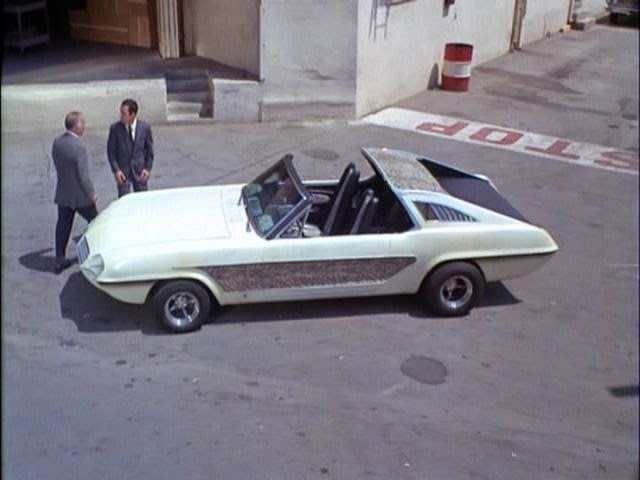 The rear end was completely restyled as well, with a Targa-style roof and removable Landau top (also used on a ’66 Thunderbird that appeared in the movie). The fastback roofline slopes down into a pair of mini-fins protruding from the sides of the tail panel. Body creases starting in front of the lower section of the rear wheels flow into the rear quarters, dividing the upper and lower halves of the pointed fenders. Barris and Korkes fabricated a full-width tail panel, plus a new rolled rear pan, and frenched license plate holder. 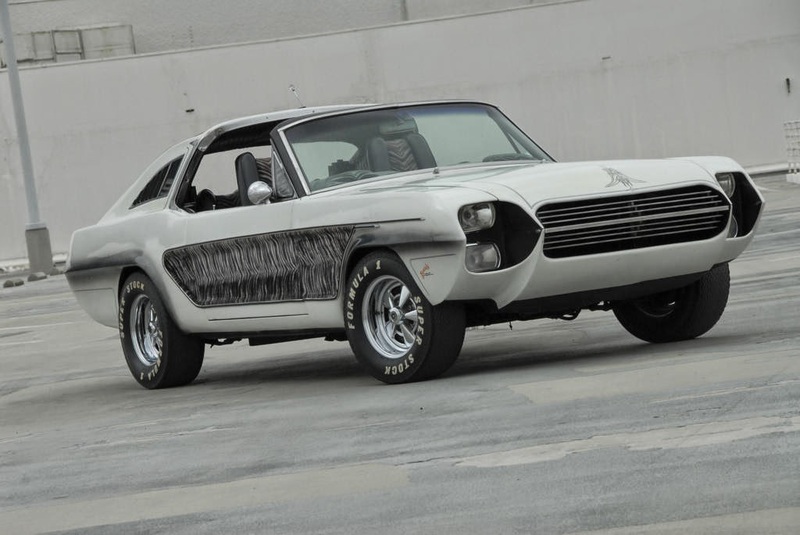 The body had a two-tone color scheme, pearl white with a satin-black rear decklid underneath the Zebra skin. It featured also some Pearl red fadeaways around the body moldings. To use Sinatra’s terms, a “player” who likes to “swing” would fit right in with the gamey cockpit, with its liquor-bottle sized cupholders (unusual for the time) and calliope plastic-tube speaker covers. Just the thing when you’re headed to a “clam bake” (party) to enjoy a few shots of “gasoline” (Jack Daniels, Frank’s favorite drink). A small-screen black-and-white TV graces the dash, also unusual for its day, long before LCD monitors came into vogue. This must have been a groovy ride for going out on the town with a ring-a-ding “barn burner” (a very stylish, classy woman). Of course this customized Mustang was a really strange cat, but it hails from the time of hepcats, when movie cars (and stars) were outlandish, even outrageous. 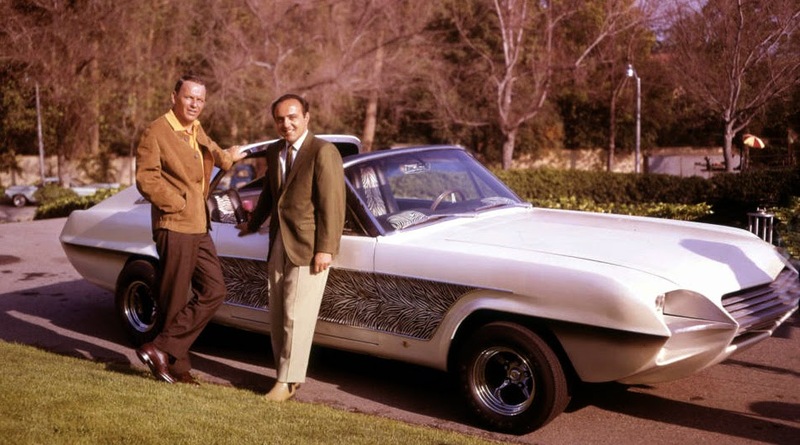 After all, it’s from the hands of George Barris, known for such wild and wacky creations as The Batmobile, Munster Koach, and the Flintstone-mobile. Not all of them were remarkable or memorable, however. That’s understandable given the sheer volume of cars done by Barris. “It would take me a couple days to count how many cars I’ve done for TV and movies,” he says. “I quit counting after 1,000.” That’s probably not much of an exaggeration, judging from his numerous Autorama and museum displays, and the stacks of Barris-inspired model cars overflowing his office shelves (where we sat down with him for a fascinating interview). Barris went on to craft some of the most legendary and beautiful cars with innovative craftsmanship, chopping tops and sectioning frames to produce flowing, uninterrupted lines. 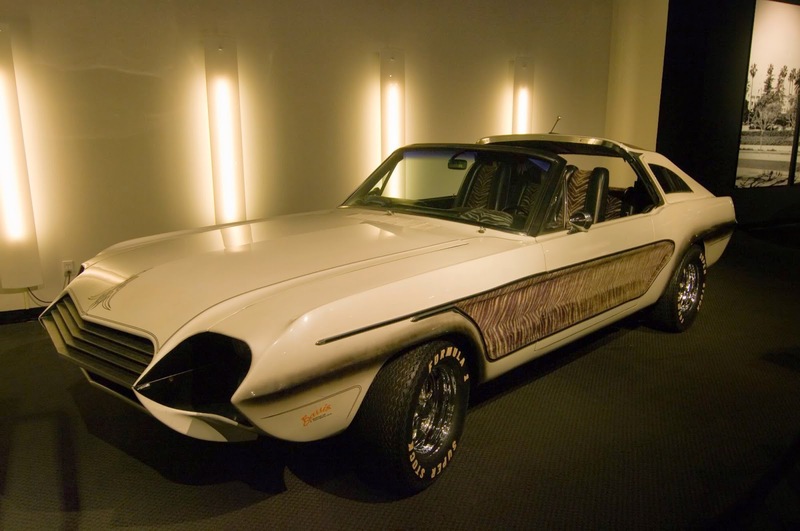 Some of his more noteworthy, high-fashion Kustoms (as he spells the word) have been displayed at the renowned Petersen Automotive Museum in Los Angeles, along with a full-scale diorama of customizing workshop outfitted with special tools donated by Barris. One of the most famous and beautiful on display is the Hirohata Merc, a hybrid design incorporating parts from several other cars. After it appeared in the 1955 movie, Running Wild, the Hirohata Merc became the calling card Barris needed to take the quantum leap into becoming the premier “kustom” house in America. One of his most famous kustoms, the “Ala Kart” (based on a ’29 Ford) was the only car ever to win the prestigious Oakland Roadster Show two years in a row.